Kraków is located in southern Poland, on the Vistula River in the Małopolska region, in the relative proximity of the borders with the Czech Republic and Slovakia. Every year, Kraków is visited by millions of tourists who come to enjoy the city’s beauty and history. Kraków has traditionally been one of the leading centres of Polish academic, cultural, and artistic life and now offers visitors a whole range of its rich heritage. Wawel Cathedral and the Royal Castle, the St. Mary’s Basilica and the largest medieval market square in Europe, the Rynek Główny, are definitely a must-see when visiting the city. Besides historical center, we recommend a visit to Wieliczka Salt Mine, one of the most valuable objects of material and spiritual culture in Poland. Opened in the 13th century, the mine was producing table salt continuously until 2007, as one of the world’s oldest salt mines in operation. Each year it is visited by more than one million tourists from all over the world. It is also a world class monument, featuring among twelve objects on the UNESCO’s World Cultural and Natural Heritage List. But Kraków is not just a cultural heritage. Krakow offers visitors many restaurants, bars and cafes. Particularly popular is Kazimierz, the old Jewish district, considered by many to be the center of Kraków’s nightlife. Of course, you’ll also find there many places worth seeing, including seven (main) synagogues, which constitute the largest such complex in Europe next to Prague. Cracow University of Economics (CUE) is Poland’s largest university of economics, operating since 1925. CUE has five Faculties, all of which have full academic rights. These faculties – Faculty of Economics and International Relations, Faculty of Public Economy and Administration, Faculty of Finance and Law, Faculty of Commodity Science and Faculty of Management. With almost 23,000 students CUE offers a wide choice of academic programmes including various study programs in English. The university campus is within a short walk from the old town centre and major communication hubs. 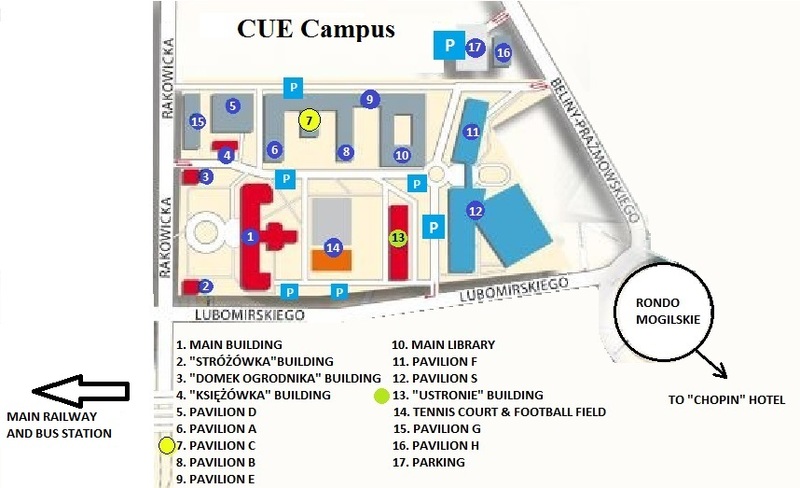 The campus is located at 27 Rakowicka Street, near the main railway station (see the map).